Some of the tasks are lacking an act. Others have resources that no students ask for (at least students that I’ve worked with). So, I finally had a minute (read 2 days) and revisited each. Below, you’ll see the tasks I’ve chosen to revisit. An explanation of the original, what I changed, and why I changed it follows. If you’d like to skip this and get to the revisited tasks, click here. My very first attempt at a 3-act task was the Candy Bowl task. I was working in an elementary school at the time and Graham Fletcher had created problem to get 2nd and 3rd grade students reasoning about subtraction by removing the numbers from the problem context. His context involved the lunchroom and numbers of students in three classes. We talked on the phone about this for a while and though I liked the problem, I wasn’t crazy about the context. I sat in my room trying to think of a context that would be a bit more engaging for students to think about. And the Candy Bowl was created. 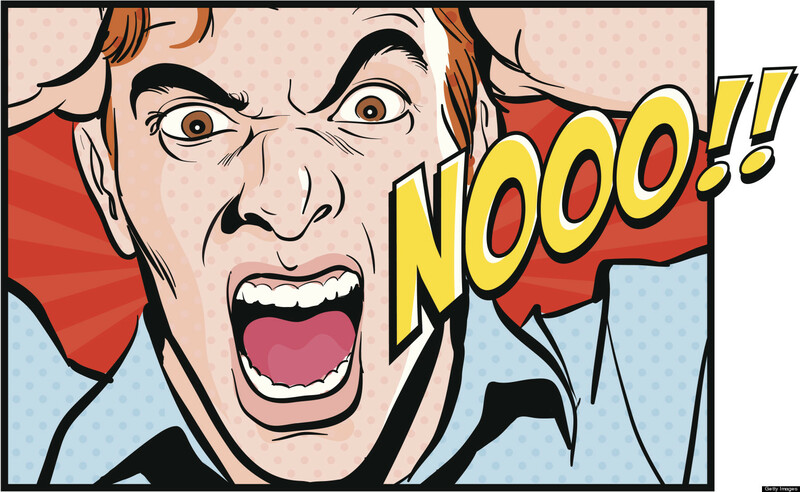 It was a good problem, but it really lacked one of the most basic parts of a 3-Act Task… The third act. The reveal was weak, because it relied on the teacher to give students validation. The updated version, which had to be done from scratch (apparently whoppers candies are no where to be found anywhere near Valentine’s day), can be found here with all new updated resources for Act 2 and new video including two reveals, depending on which question students decide to tackle. Another one of my early tasks was Sweet Tart Hearts. I really liked this one from the beginning. There is a huge focus on estimation which allows for students to obtain solutions that are close, but not exact in most cases. This also allows for the teacher to facilitate a discussion about why answers may not be exact for a variety of reasons. But again, it really lacked that third act. The task was good, but the closing of the lesson was weak due to the fact that the students were relying on the “all knowing” teacher to give them affirmation. Apparently Sweet Tart Hearts are a hot commodity a few days before Valentine’s day. I went out the other day for a quick run to pick up a bag. I had to go to 4 stores and finally found a bag (the last one). I thought it would take about 10 minutes to do this revisit. Surely the numbers for the colors would be similar to the last time. Not only was that not true, but Sweet Tarts changed the orange hearts to yellow! But, the revisit is all done and I’m very pleased with the new reveal which allows the video to reveal the answer and the teacher to focus students on the reasonableness of their solutions. My final revisit is the Penny Cube. It is probably my favorite task. I’ve certainly heard more from teachers about this task than any of the others. I think I got the reveal right on this one. The problem I found with this task was that I thought students would ask for things that I would want. The first time I did this task with students, I guided them to the information I had ready for them. They didn’t care anything about the dimensions of a penny. They just wanted some pennies and a ruler. It’s amazing what you learn when you listen to students, rather than try to tell them everything you think they need to know. So, to all of the students out there, Thank you for making your voices heard! So, this was the quickest fix. I just updated the Penny Cube page (all of the coin specifications are still there – in case anyone wants them). Note: In this post I share how I changed my approach to teaching the Penny Cube task. So, it took a few days, but I’ve revisited some tasks that have been bugging me for a while and I hope it’s for the best. I know I’ll probably give these another look in the future. I’ll just need to start in early January to make sure I get the candy I need. I recently got back from Santa Fe. I was attending a conference there for a few days last week and afterward, I drove to El Paso to visit my brother’s family (he’s currently stationed in the middle east so I didn’t get to see him – unless you count face time) for a day before flying home. Let me preface this story by saying that we all probably have a story similar this, but how we handle it can be a possible game changer. Cashier: May I take your order? Me: Yes, please. I’d like a number 2. Cashier: (after pushing more buttons than is conceivably necessary to enter my choice of “medium”): Your total will be $6.05. I dug through my wallet (receipts from the trip and everything) and found that all I had was a $10 bill, so I handed it to her. She entered $10.00 correctly and the correct change of $3.95 showed up on the little screen. At just about that point, I remembered that I had a bunch of change in my pocket and said quite enthusiastically, “Oh, wait, I think I have a nickel.” Who wants to carry around $0.95 in change in their pocket. The cashier didn’t miss a beat, and said, “So, your change will be $4.00 even.” I kind of smiled as I continued to look through my change, proud that she had a mental strategy to adjust to the situation and that she seemed quite confident and comfortable using it in this situation. I went into math teacher mode and waited patiently for her to begin breathing again. And then I waited for her begin thinking. She adjusted my change with my introduction of the idea of a nickel, why not a dime? After what seemed like 5 minutes (probably more to her), it was painfully obvious to all around that her anxiety in this situation was taking over her ability to tackle this problem. So, I tried to think of a “least helpful question” to ask. Now I put myself on the spot. If she only knew that we were both now feeling some of this pressure. So, I finally asked her my question and she gave me the correct change within a few seconds. She smiled as she gave me my change and my new “unknown” student and I parted ways. I know I felt good about helping someone develop a strategy outside of the classroom. I hope she had a similar feeling about learning to make sense (no pun here) of making change. Being a math teacher is a 24-7 job sometimes and we can find our students anywhere – even in a fast food restaurant in New Mexico! What you would have asked the cashier in this situation. I’d love to hear what your “least helpful” question would have been. No pressure, take as long as you like. No one is waiting in line behind you! Me: So, Connor, what have you been working on in your coordinate algebra class? Me: What kinds of lines are you graphing? Me: Are they linear functions. Me: Like what kind of curves? Me: Hey, I want to show you something. . .
Connor: We did something cool in class today. Me: Oh, yeah? What was it? Connor: We had to build a picture using graphs of different lines. We built a shamrock. Me: That’s what I’ve been meaning to show you all week. Go grab my laptop. Connor: (playing game of war on an ipad) But I finished my homework. Me: Just take a look at this for a few minutes and see what you think. 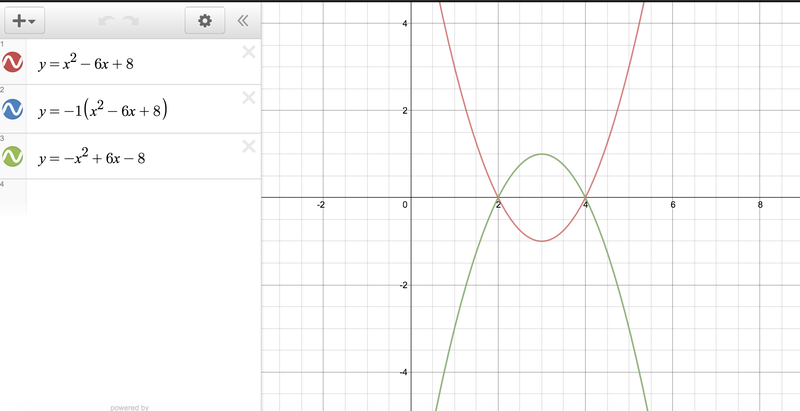 Enter Des-Man from Desmos. Once he had gone through the tutorial, he was hooked. . . for a while! He engaged in this for about 2 1/2 hours. When he wanted to make something happen, but didn’t know how, he would come to me and ask. We’d figure it out together. The best part of this whole experience was when he realized he knew how to create something on his own and went to his math work from class as a reference. Fast forward to 2 1/2 hours later, when Connor finished his Desman. 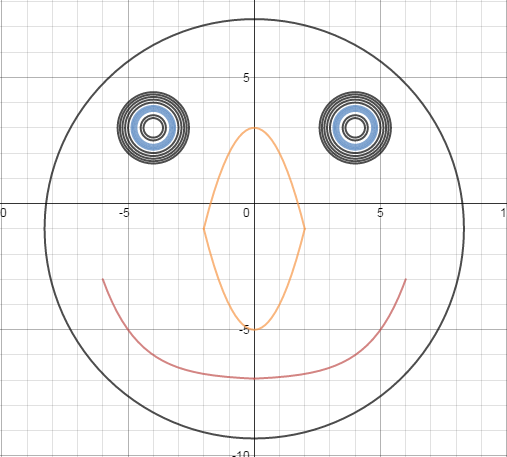 To see the picture in detail along with the equations Connor used to create this graph, click Connor Face Graph. It didn’t stop there. I had some tabs open and clicked on one with the In-N-Out Burger task from Robert Kaplinsky. He was curious enough to work through it even after all of the Des-man work. So, I showed him more by clicking on the Open Middle tab (also from Robert Kaplinsky). I selfishly pulled up the task that I wrote in collaboration with Graham Fletcher called The Greatest Difference of Two Rounded Numbers. After making sense of the problem, and a lot of eye opening moments that led to phrases like “Oh, I can make it larger!” He got what he thought was the final answer and we validated his reasoning by clicking on the answer. A slight smile! So, we’re looking at close to 3 hours of after homework math investigation that ranged from rounding numbers to graphing equations, and solving problems. Sounds like a great evening to me. Great conversations and fun while learning and reinforcing mathematics understanding! What could be better? 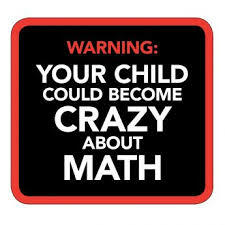 Talking Math With Your Kids – High School Edition. Feed the hunger of all ages! 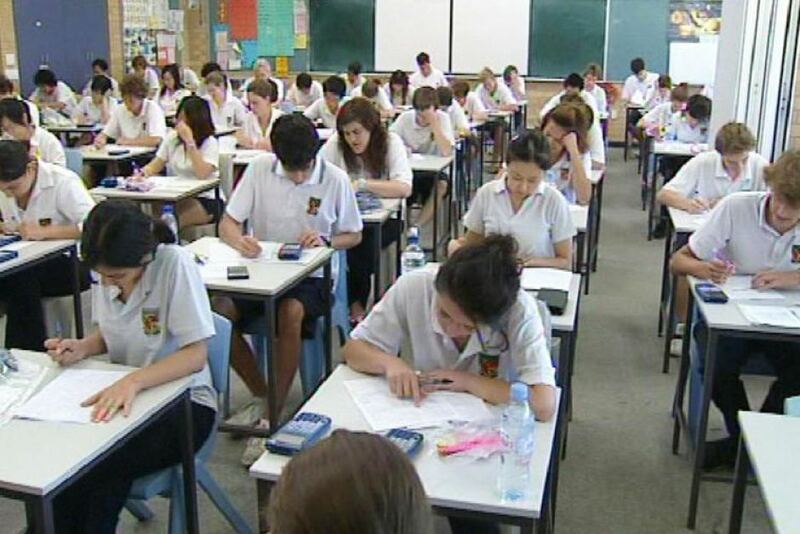 Not understanding mathematics can be extremely frustrating for students. As a teacher, figuring out how to help students understand mathematics can be just as frustrating. My primary go-to resource for these situations is Teaching Student-Centered Mathematics, by John Van de Walle et. al. because it’s all about focusing on big ideas and helping students make sense of the math they’re learning in a conceptual way. 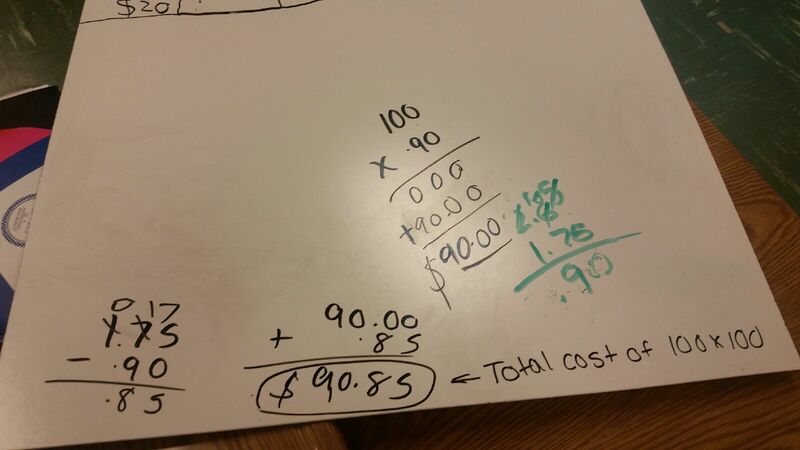 Recently, I was asked to model a lesson for a 6th grade class who was having difficulty working with percents. So, I turned to my go-to resource, and during planning, I realized that I didn’t know anything about these students other than that they were struggling with percents. So, I couldn’t assume anything. I ended up creating three separate lessons and combined them into 1. First, I handed groups of students a set of Percent Cards and Circle Graph Cards. Their task was to match the percent with the corresponding circle graph. As students were working on this, I heard groups reasoning about how they were matching the cards. Many started with benchmarks of 25%, 50%, and 75%, while others started with the smallest (10%) and matching it to the graph with the smallest wedge. 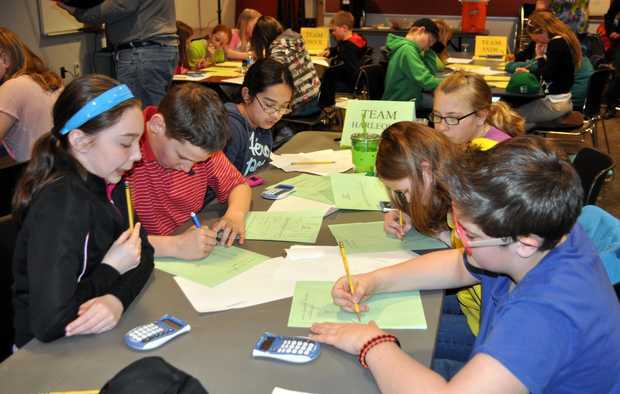 As groups finished, they were asked to find pairs, using the matches they made, that totaled 100%. 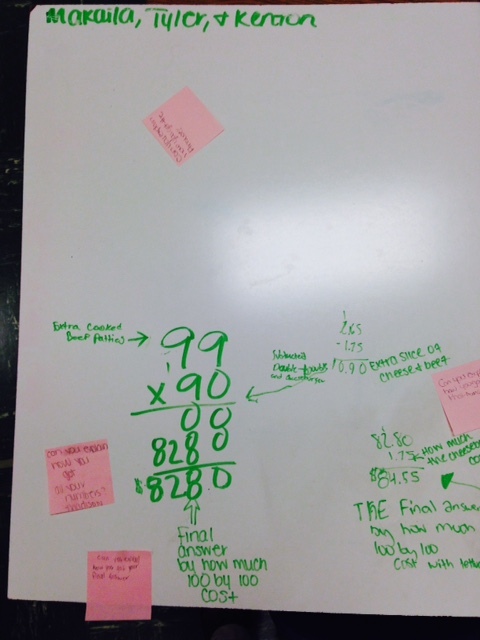 Once finished, a discussion about their process for completing these tasks revealed a solid understanding of percent as representing a part of a whole. Now to shake their world up a bit. I asked them to leave their cards because they would be using them again shortly. I introduced these Percent circles and asked them what they were. A brief discussion revealed some misconceptions. Some students said they were fractions, others said they were wholes because nothing was shaded. I altered my planned line of questioning to questions that eventually led to a common understanding of what fractions were and how the pictures of the fraction (percent) circles really showed wholes and parts (fractions). Their next task was to match their cards with the equivalent fraction circle. This was incredibly eye-opening. Groups began to notice that some percent card matches could fit with multiple fraction circles (50% could be matched with the halves, quarters, eighths, and tenths). Thirds and eighths were the last to be matched. But their reasoning didn’t disappoint. One group noticed that the percents ending in .5 all belonged with the eighths because they were too small to be thirds (the other percents with decimals). Fractions and percents are the same because the pieces look the same. I don’t get why the eighths end in .5. The percents all can be fractions. Finally, I asked students to solve a percent problem (now that they’ve all realized that fractions and percents can be used interchangeably). I gave them the m & m problem from this set of percent problem cards. The only direction I gave was that they had to solve the problem using some representation of the percent in the problem before they wrote any numbers. My bag of M&M’s had 30 candies inside. 40% of the candies were brown. How many brown candies is that? While this was problematic at first, students looked at their fraction circles and percent cards and realized they could use four of the tenths since each tenth was the same as 10%. Most students needed just one “least helpful” question to get on the right track: Where do the 30 m & m’s belong in your representation? We can’t assume understanding from correct answers alone. We need to listen to students reason through problematic situations. Students really want to share their thinking when they realize that someone is really interested in hearing it. Students crave understanding. They really want to make sense. Procedures are important, but not at the expense of understanding. Empowering students by allowing them to build their own understanding and allowing them to make connections allows students to feel comfortable taking risks in problem solving. 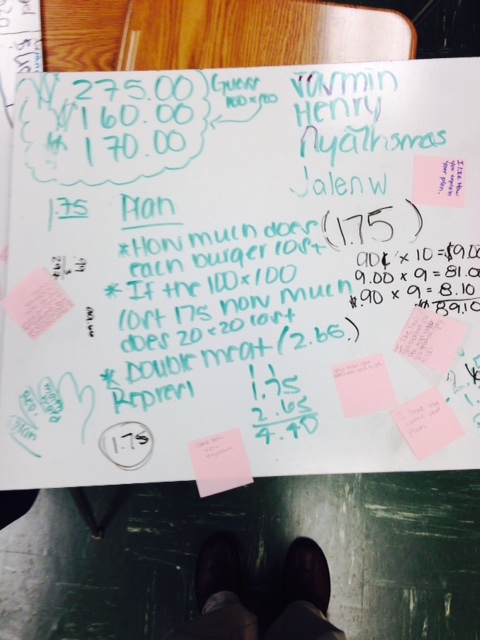 Please take a look at Jenise Sexton’s recent blog about percents with 7th grade students for some fantastic ideas about students using number lines and double number lines to solve percent problems. It’s SWEET! The following is a reflection on a 3-Act task I modeled for an 8th grade teacher last week. The 3-Act is In-N-Out Burger from Robert Kaplinsky and the plan I followed I completely stole from the amazing @approx_normal ‘s blog post on her work with the same 3-Act with administrators last year. How much does it (100×100 burger) cost? There were just a couple more, and they all came up very quickly. The students were curious from the moment we started the lesson. They are still working on precision of language. The parentheses in their questions above denote that this phrase was not used in the question, but was implied by the students. We had to ask what “it” or “that” was periodically throughout the lesson as they worked and as time went on, they did become more consistent. How much does it (the 100×100 burger) cost? 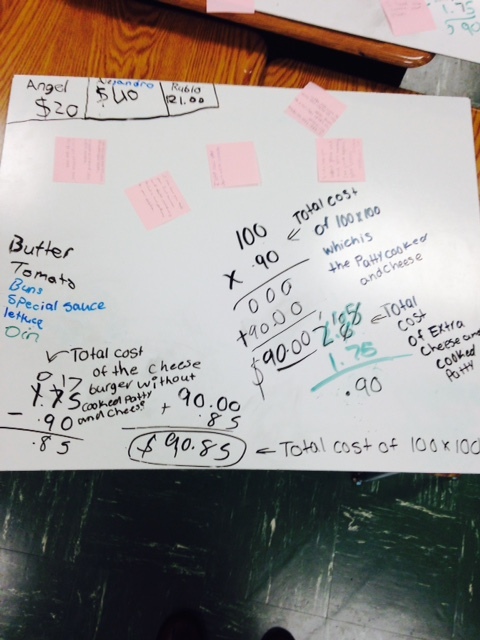 Students made estimates that ranged from $20 to $150. We discussed this briefly and decided that the cost of the 100 x 100 burger would be somewhere between $20 and $150, and many said it would be closer to $150 because “Cheeseburgers cost like $1.00, and double cheeseburgers cost like $1.50, so it’s got to be close to $150.” That’s some pretty sound reasoning for an estimate by a “low” student. As students began Act 2, they struggled a bit. 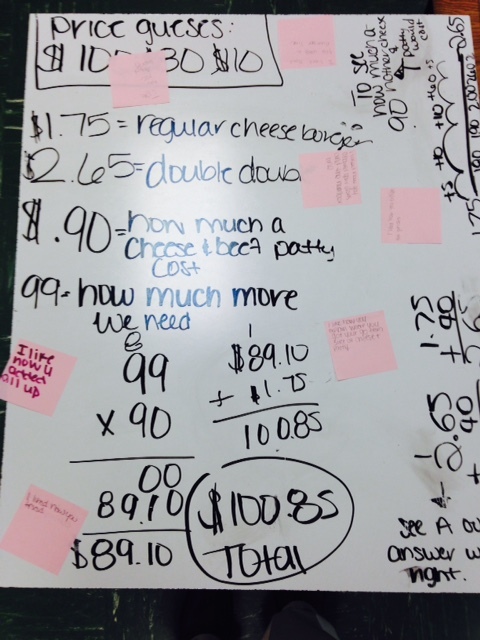 They weren’t used to seeking out information needed, but they persevered and decided that they needed to know how much a regular In-N-Out cheeseburger would cost, so I showed them the menu and they got to work. I sat down with one group consisting of 2 boys (who were tossing ideas back and forth) and 1 girl (Angel) who was staring at the menu projected at the front of the room. She wasn’t lost. She had that look that says “I think I’ve got something.” So, I opened the door for her and asked her to share whatever idea she had that was in her head. She said, “Well, I think we need to find out how much just one beef patty and one slice of cheese costs, because when we buy a double double we aren’t paying for all of that other stuff, like lettuce and tomato and everything.” The boys chimed in: “Yeah.” I asked them how they would figure it out. Angel: “I think we could subtract the double-double and the regular cheeseburger. 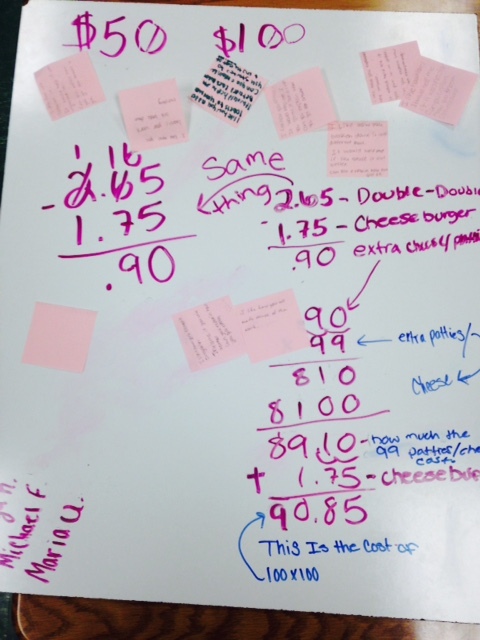 The boys, chimed in again: “Yeah, because all you get extra for the double double is 1 cheese and 1 beef.” “Well done, Angel!” You helped yourself and your group make sense of the problem and you helped create a strategy to solve this problem! Angel: (Proud Smile)! We had to stop, since class time was over. 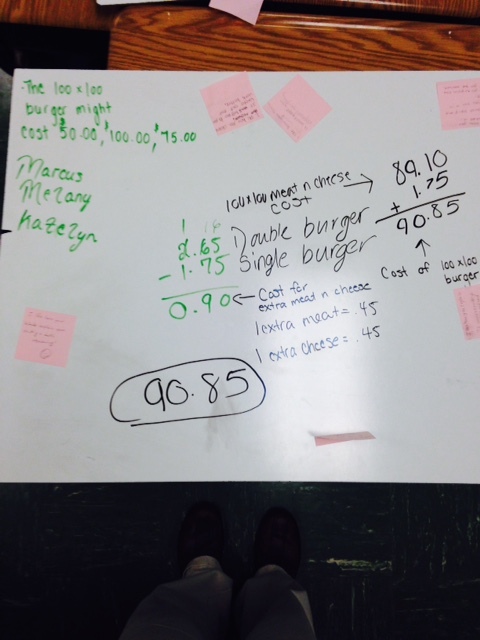 Other groups were also just making sense of the idea that they couldn’t just multiply the cost of a cheeseburger by 100, since they didn’t think they should have to pay for all of the lettuce, tomato, onion, etc. 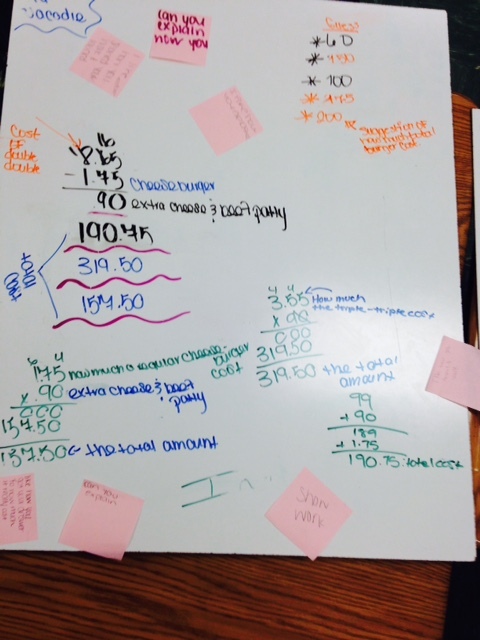 Many groups had a similar answer, but followed different solution pathways. I wanted them to share, but I also wanted them to see the value in looking at other students’ work to learn from it. 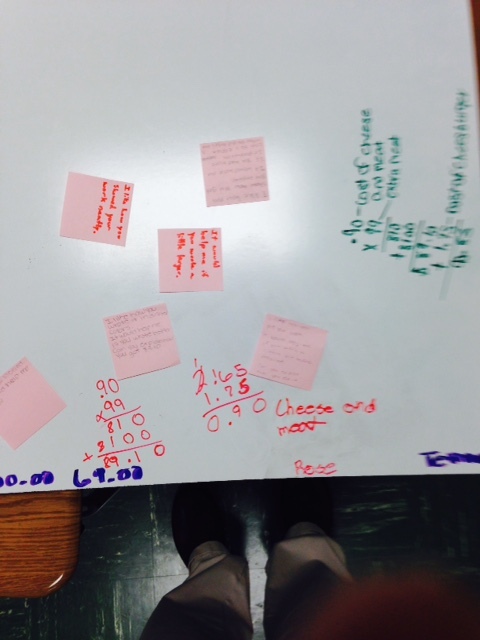 So I showed this group’s work (below-it didn’t have the post-its on it then. That’s next.). I asked them to discuss what they like about the group’s work and what might make it clearer to understand for anyone who just walked in the classroom. I like how they have everything one way (top to bottom). I like how they have some labels. I’m not sure where the 99 came from. Maybe they could label that. I like how you. . . It would help me if you. . .
Can you explain how you. . . I like how you showed your work and labeled everything. I like how you broke it down into broke it down into separate parts. It would help me if you spaced it out better. I like how you explained your answer. It would help me if it was neater. I like how you explain your prices. I like how you wrote your plan. I like how you explain your plan. I like how you told what you were going to do. Can you explain how you got your numbers. I like how you wrote it in different colors. It would help me if you wrote a little larger. Not only was the feedback helpful to groups as they returned to their seats, it was positive. Students were excited to see what their peers wrote about their work. Now for the best part! Remember Angel? As she was packing up to leave, I asked her if her brain hurt. She said, “No.” After a short pause she added, “I actually feel smart!” As she turned the corner to head to class, there was a faint, proud smile on her face. 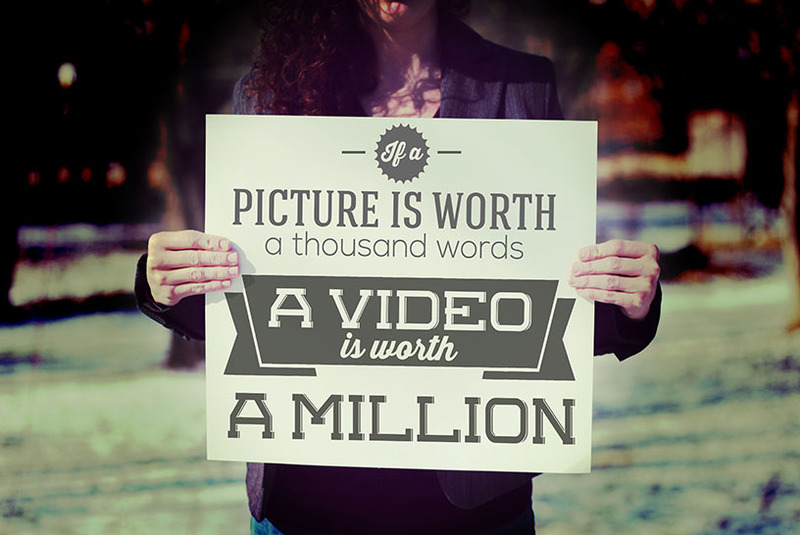 Score one for meaningful math lessons that empower students. Please check out the websites I mentioned in this post. These are smart people sharing smart teaching practices that are best for students. We can all learn from them.